The heinous murder of social media star Qandeel Baloch has triggered a long-overdue wave of introspection in Pakistan about how it treats its women. Her “honor killing,” at the hands of her own brother, has embarrassed the state into taking action against the impunity clause for such crimes, which was built into the law by a military dictator. It has also given fresh impetus to the public conversation on women’s rights, their bodies and the culture of oppression that leads to women being treated and typecast as chattel in unsettlingly large swathes of our society. Qandeel Baloch was untypical in both her courage and her chosen path of irreverent resistance to the cloying misogyny that defines many shades of Pakistani gray. Her choice not to conform was itself an act of defiance against the claustrophobia of her culture, and her death brought a heartbreaking struggle to light. She had been financially supporting the brother who killed her. Yet Qandeel’s tragic death sparked a fire in a smoldering woodpile. Public outrage against legal sanction for crimes of passion is not new in Pakistan. A long honor roll of female champions of change, in civil society and public life, has led to several rights-based laws being introduced in Pakistan’s parliament since 2003. However, many more activists have worked hard to mainstream women’s entitlements in political discourse – often facing imprisonment and punitive public violence for resisting the insertion of discriminatory laws into Pakistan’s penal codes – only to have their struggles met with failure. Instead of progress, there has been an alarming uptrend of crimes against women in the name of “honor.” The facts on the ground are chilling. Between 2008 and 2015, more than 4,000 women have been murdered in Pakistan for “honor.” These count for just the reported cases. Just last month, 17-year-old Zeenat was doused with kerosene and set on fire by her own mother for marrying the man of her choice. She was buried by her in-laws because no one from her family wanted to claim her charred remains. A week before that, 22-year-old Muqadas, the mother of a 10-year-old and seven months pregnant, had her throat slit by her own mother, brother and father. She too had married the man of her choice. Instead of progress, in fact, there has been an alarming uptrend of crimes against women in the name of “honour”. This chilling chronology of horrors finally broke some political china last month. When news of these and other murders spread across Pakistan – close on the heels of a screening of award-winning filmmaker Sharmeen Obaid’s documentary on the subject at the prime minister’s official residence – the public mood turned dark. After raising hope for change, the action timeline from the government had faltered, dithering in the face of chest thumping from the religious right. Despite the media and parliament’s growing demand to change the law that allowed families to forgive the murderer, reform was endangered by the forces of extremism that had been flexing political muscle for over three decades. Women’s laws became once again the scorched space where two forces in Pakistan clashed. At the core of the resistance to change lay the politics of the religious parties who, despite their low parliamentary strength, were able to block the passage of many laws that aimed to do away with the right of the victim’s family to forgive their daughters’ murderers. The pattern was clear. Every time a law to end the compoundability, or forgiveness clause, for women’s “honored” murderers was proposed, it would be rendered toothless or face crippling executive delay. Then social and digital media took the frontline in the battle. A surge in coverage of such crimes meant that the crescendo of public clamor for justice stayed in the headlines. Parliament, too, stayed the course as a force for change, which is why next month Pakistan will see the third introduction of a law that will block the ability of a victim’s family to forgive her murderer. The killer will face a life sentence of 25 years, irrespective of whether the family of the victim excuses the act. Every time a law to end the compoundability, or forgiveness clause for women’s ‘honoured’ murderers landed up with government, it would be rendered toothless or face crippling executive delay. Activists have welcomed this show of political ballast, but the jury is still out on whether this law will actually kill the beast at the heart of this battle: the forgiveness clause. 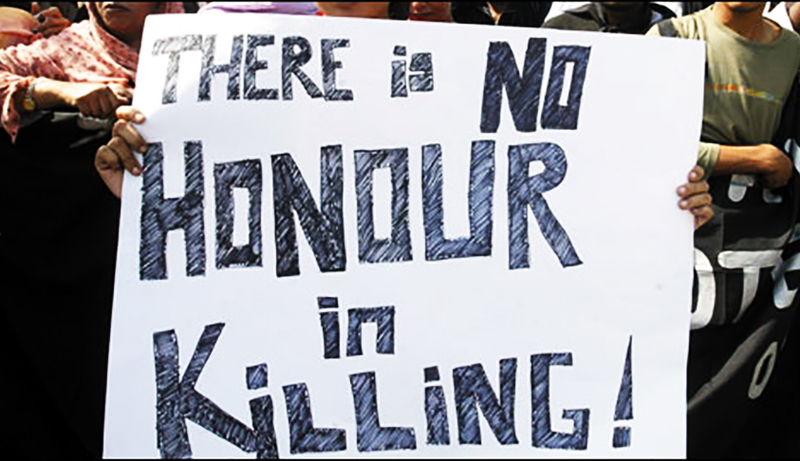 The good news is that in parliament, many will still vote for “honor” killings to be counted as premeditated murder, anxious not to block a law that will, in its increment, bring justice for big-ticket crimes. The bad news is that in lesser known cases, the justice culture bred by the forgiveness clause will still allow women who are threatened or injured, even maimed for life, to succumb to reactionary pressures from family and communities. In many cases, the fight to save vulnerable women from certain abuse will not end with this law. After the law is passed, the murder of women and men in Pakistan will still be open to the forgiveness clause. How? Men who kill women for honor often argue in court that they did not do so for honor. These killers will still be forgiven quietly for murder and be freed from jail with a light sentence. Despite the coalitions for change on the ground the resistance put up by powerful elites vested in rightist privilege still has anchor. The bigger fight, in fact, may have just begun. Senator Sherry Rehman is President of the Jinnah Institute and Vice-President of the Pakistan Peoples Party. She has served as Pakistan’s Ambassador to the United States, and Minister Information in Pakistan’s Government.